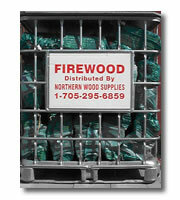 Northern Wood Supplies has been distributing "Quality Firewood" for over twenty years. Whether you require it at retail or wholesale, Northern Wood can look after you. We also have firewood available in convenient bags. For a quote on your next purchase of firewood, email us, or give us a call. You won't be disappointed. When you need to pick up a quantity smaller than one cord, call or stop by PFW Country Store on Highway # 7, just east of Peterborough. From trunkloads to face cords and kindling, they have it in the stock ready to go. For more information on how to heat your home please read our helpful article on heating your home with wood.